Sam Motors Thailand and its sister company our parent company Sam Auto Group Thailand are Thailand's best exporter of Toyota Hilux Vigo, Toyota Hilux Tiger, Toyota Sport Cruiser and Toyota Sport Rider SUV. 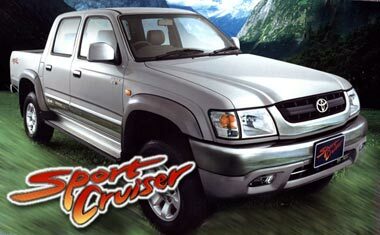 Toyota SportCruiser was the name Toyota gave to its Toyota Hilux with D4D engine that ruled the roost from 2002 to late 2004 with the release of Toyota Vigo. Even though Toyota had named it Sport Cruiser, many kept calling it Tiger. You can purchase directly from Thailand or from our Dubai branch Sam Motors Dubai. Please check pictures of Toyota Hilux Tiger, Toyota Hilux Vigo, Toyota Fortuner, Mitsubishi L200 Triton and Nissan Navara among others. 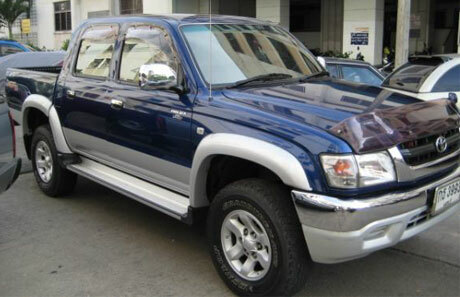 Wildly popular Hilux Vigo's proud predecessors are Toyota Sportcruiser and Hilux Tiger. Please note that we are using the Toyota Tiger as a category to include Toyota D4D Tiger which was officially called Sportcruiser but is still called Toyota Tiger by some dealers. Toyota had been building cars and trucks in Thailand since 1956 and now owns three major assembly plants here, with vehicles and parts being exported to other countries. It was with the Hilux Tiger, that Toyota decided to make Thailand the hub of its manufacturing: instead of exporting Hilux from its Japanese plant, it made a strategic shift by exporting it to Australia from its Thai plant. Vigo is now being exported worldwide.